The timing of Kay Chaffey’s goodbye was fitting. It was dark for a moment that Monday morning, August 21, as the sun was disappearing behind the moon for a total eclipse. Kay passed away in Oregon where she spent the final years of her life. The sun didn’t come back to shine on her that day. She’s gone, and will be greatly missed by so many in so many ways. Born Lois Kay Gott in Nampa, Idaho, Kay lived her whole life in the Northwest. As a girl, she joined the Girl Scouts and excelled in sports, especially tennis. She also learned to fly airplanes in nearby Caldwell, long before she ever drove a car. At age 18, Kay convinced her aunt to loan her $50 so she could pay her tuition at the College of Idaho. But sensing a war was coming she dropped out and entered the Civilian Pilot Training Program and got a flying license. 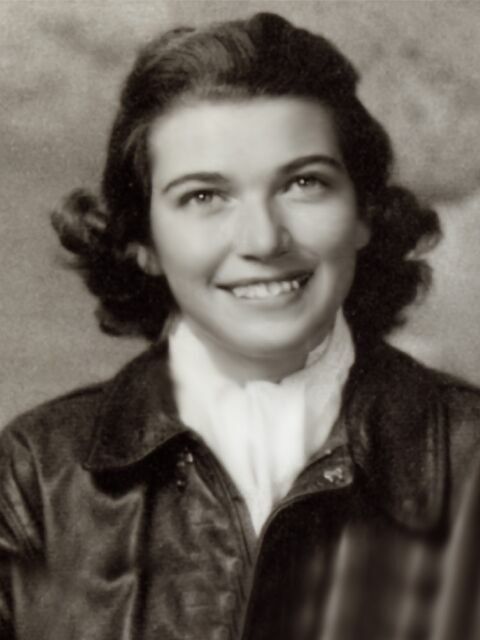 In 1942, when WWII came, Kay was selected as part of the second wave of a volunteer paramilitary organization known as Women’s Airforce Service Pilots or WASPs. She flew 17 different types of fighter planes from the P-51 Mustang (her favorite) to B-25 Mitchells, ferrying the planes throughout the United States until the fighting was done. With the war over, she returned to the College of Idaho to complete her B. A., then received an M.A. from Univ. of Oregon in Eugene. In 1950, she became a physical education assistant professor at what was then Humboldt State College. She taught archery, tennis and badminton and her favorite, dance: modern dance, social dance and her extra favorite, international folk dance. Somewhere along the way she met a local boy, the love of her life, Keith Chaffey. They married in 1963. He served as her dance partner when he wasn’t teaching local children, with a focus on Humboldt Country’s deaf community. Keith and Kay loved traveling the world together, from climbing up to Machu Picchu, to seeing the bronze horses high in Venice’s St. Mark’s square, to watching moose graze near Mt. Denali in Alaska, along the way learning new dances or just exploring the wonders of nature. In 1982, after 32 fulfilling years teaching, Kay retired. She then moved on to the next phase of her life, writing books. Her work there reflected her strong sense of history and her passionate drive to record the experiences of individuals and groups. Her first book was Women in Pursuit: Flying Fighters for the Air Transport Command, published in 1993. Next came Hazel Ah Ying Lee, Women Airforce Service Pilot, World War II: A Portrait, published in 1996, telling the story of a Chinese-American WASP pilot, who died in a fiery plane crash. Next she turned her collection of photos and scrapbooks detailing her teaching career into Celebrating Dance: Three Decades at Humboldt State, 1950-1982. When Kay was hired in 1950 to teach p.e., the department was small — just the dep. head, a coach, and Kay. It was a time when programs were being built and people had opportunities to be creative. In addition women’s sports, Kay was assigned to teach folk dance. Having no background in dance, she spent her Christmas vacation at a workshop at Mills College, wearing out five pairs of shoes. That was the first of many trips, here and abroad, to study dance and folk dance under master teachers. Deeply aware of Humboldt’s isolation, she brought nationally recognized performers and teachers of modern and folk dance to give performances and workshops. She attended dance camps and brought back music and dances to teach and encouraged students to attend dance camps. Kay believed that customs, costumes and cultures were intrinsic to the dances and included them in her teaching. Class parties had themes with appropriate costumes and food. Exhibition groups frequently made their own costumes. Kay collected textiles and pieces from folk costumes during her travels to assist them. They danced at schools, churches, the Swiss Club, the Runeberg Lodge, community events, etc. They made lasting relationships with the local ethnic groups whose dances they performed. It should be noted, that for Kay, “international” was just that, no real borders, everything from African and South Seas Islands to Latin American and Native American dance in addition to Jewish and European dances. Basically, Kay was an exuberant and energetic person who delighted in delving into new experiences, making connections with people and giving fully of her time and energy. Folk dancers did a joint performance with Bonnie Messenger’s Reader’s Theater. She took her modern dance classes to the beach where the dancers became models for Tom Knight’s photography classes. Another chapter in her life became another book, Flying the ’64 Flood, published in 2009. For as long as she could, Kay kept up with her piloting skills. She maintained a commercial pilot’s license for years. In 1964, when Northern California was hard hit by a flood that completely cut off the Northcoast from the rest of the world, she was one of those who risked their lives flying relief missions. After a long campaign, in 1979, the U.S. Air Force finally took the retroactive step of including all WASP pilots as official members of the U.S. Air Force, with veterans benefits. In 2010, she joined many of the surviving WASPs at the Capitol in Washington, D.C. where the U.S. Congress honored the women with the Congressional Gold Medal in tribute to their unsung heroism. Kay was deeply involved with the North Coast Vintage Aircraft Society. Again, she had a strong sense of the importance of recording life experiences. Aware that many pilots in the aircraft society were aging and concerned that their experiences would be lost, she helped gather their oral histories on tape. In turn, Kay was interviewed in 1999 for the KEET-TV series, Living Biographies. In 2008, Kay was named to the North Coast Aviation Society’s Hall of Fame and additionally presented with a Certificate of Congressional Recognition. Kay was an avid bird-watcher with a long life list and served as secretary of the Redwood Region Audubon Society. She was also an environmental activist who supported the Nature Conservancy and the work of the Northcoast Environmental Center. She was active in the battle to save the standing redwood groves in Northern California when they were being logged off in the early ‘60s. Remember, this was a time when that was not a popular stance for a teacher at Humboldt State. In short, she played a pivotal role in establishing Redwood National Park. Kay and Keith never had children of their own. Despite this, a clipping she shared in Celebrating Dance notes that she was named the 1968 “Mother of the Year” at Humboldt State. Kay was like everyone’s mom, someone to lean on when a friend was needed. Despite the fact that Humboldt was much of her life for more than a half century, in June of 2004 she left her home here to spend her waning days in Rogue Valley Manor, a retirement home in Medford. She didn’t ever want to be a burden to others and felt that the manor would take care of all her needs. She is survived by nephews, Daniel and Brian Gott, a niece, P.K. Gott, and their spouses and family who tell us, “Kay was one-of-a-kind, and her rich laughter will be greatly missed by all who knew her.” Join them in honoring her memory on Saturday, Sept. 30, at 2 p.m. in the Sunrise Room at Rogue Valley Manor. Kay Chaffey’s legacy in folk dance will be celebrated Friday, Oct. 6, at 8 p.m. at the Humboldt Folk Dancers’ monthly party at Redwood Raks, in the Arcata Creamery, 8th and L sts. Some favorite dances Kay taught will be featured with Chubritza playing along with a winding of Kay’s beloved Maypole with the Maypole Band and Oktoberfest dances by Hansel Und Gretel’s Pumpernickel Band. All are welcome. A grand celebration for Kay Chaffey’s life is planned for Sunday, Nov. 5, from 2-5 p.m. at the Arcata Veterans Memorial Hall, 1425 J St. at the corner of 14th and J sts. All are invited to gather and share light potluck snacks and fond memories of Kay and her bright shining light. Wow. What an amazing person - certainly someone to be admired and remembered.